Jonno Lightstone, Klezkonnection's musical director, is one of Toronto's finest klezmer musicians. A clarinetist, equally at home on flute and saxophone, he is a multi-faceted musician whose projects, however eclectic, always reveal his passion for klezmer and a thorough knowledge of the idiom. He is also the leader of the Yiddish Swingtet, a trio whose music runs the gamut from traditional Eastern European klezmer to American jazz and swing. In collaboration with guitarist Brian Katz, the Lightstone / Katz duo explores rarely performed klezmer repertoire. A recent collaboration with renowned saxophonist David Mott and drummer Nick Fraser has led to the formation of Klezmology, a group dedicated to exploring the interface between klezmer music and free improvisation. 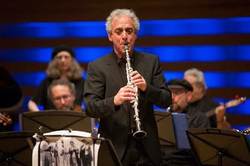 Klezmology performed at the 2014 Toronto Jazz Festival. A much sought after teacher, he instructs privately at Royal St. George College and has taught klezmer workshops at CAMMAC and at Klezkanada. He has also coached award-winning ensembles.